Here at Stagecoach Co. Wine Tours, not only do we encourage you to love what you drink – we also believe that you should love what you eat! 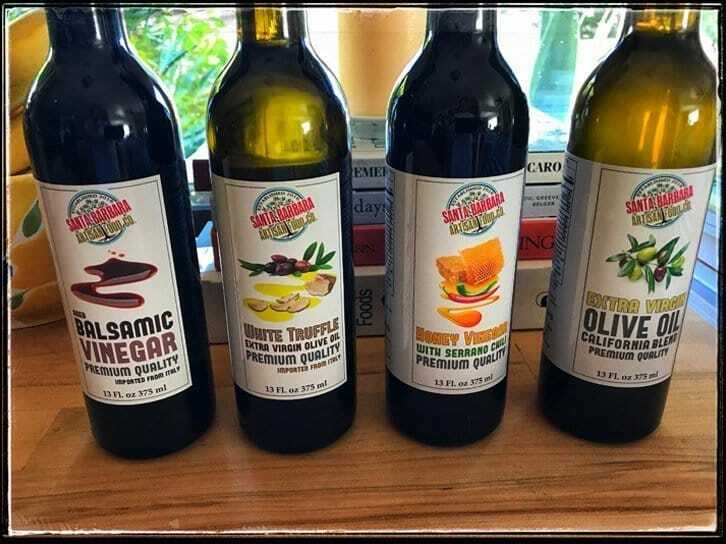 We are proud to unveil Santa Barbara Artisan Food Co., our very own subsidiary company that carries premium Olive Oils and Vinegars with a uniquely “Santa Barbara” spin! We are as passionate about food as we are about wine, and beautiful Santa Barbara County Wine Country is a hub for connoisseurs of both. We created Santa Barbara Artisan Food Co. with the mission to offer delicious fine food products that enhance and compliment everyday meals. We carefully source our products from Artisan food suppliers located throughout the world, which are made with the highest quality ingredients. Our brand represents the integrity you should expect from your food suppliers. With offerings that include White Truffle Extra Virgin Olive Oil from Italy, and Honey Vinegar with Serrano Chile, you can create the perfect wine and food pairings in your own kitchen! What’s best, if you book one of our top-rated Santa Barbara County Wine Tours, we can make sure you sample our delicious products at one of the wineries on your tour! Just mention Santa Barbara Artisan Food Co. when you reserve. Welcome our newest Tour Host to the Stagecoach Team! Wine Tour Gift Certificates, the gift of a new experience! Holiday Transportation provided by Stagecoach Co.